Muffin Tin Monday is now part of our routine and Clara looks forward to it each week. This week for Muffin Tin Monday Clara helped me fill her muffin tin with some of the things she likes to eat. It is fun to see what she picks out and it also makes me happy that she asks for these healthy fruits and veggies, hopefully she will continue to make such good food choices as she gets older!! Be sure to check out our other Muffin Tin Meals for lots of yummy and creative lunch ideas. 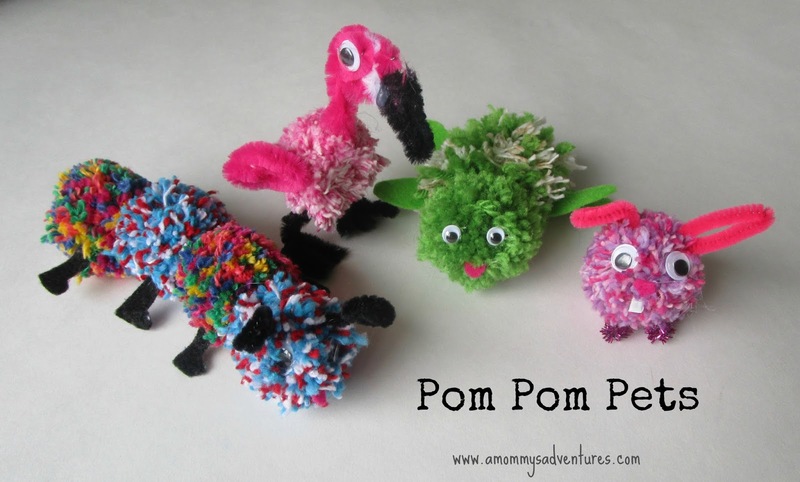 We love making our own homemade Pom Poms from yarn in all different sizes and enjoy using them in all types of games. When we decided to work on the Making Games badge with Emily's Girl Scout Brownie Troop I put out some of our big pom poms for the girls to incorporate into their own games. The girls were so amazed that I made the pom poms myself that I knew I was going to have to teach them how to make their own! So, when I was thinking what we could do for the Pets badge I decided it would be cute to have the girls create their own Pom Pom Pets out of their own homemade pom poms. This activity turned out to be one of the most fun and creative meetings that we have had together and it was so awesome to see how the girls were each able to create their own unique pom pom pet. Emily had so much fun with it that we worked on creating more of them together with Juliette the next day. For our pom pom pets the girls were able to pick from all different colors of yarn. We used both cotton and worsted weight yarn. We also used lots of other things from our craft stash such as felt, pipe cleaners, wiggly eyes, and craft foam. To make the pom poms we wrapped the yarn loosely around a piece of cardboard. I just told them if you want a fuller pom pom you wrap it a lot, if you want a thinner pom pom you wrap it less. Then we pulled it off of the cardboard and wrapped a pipe cleaner around the middle. 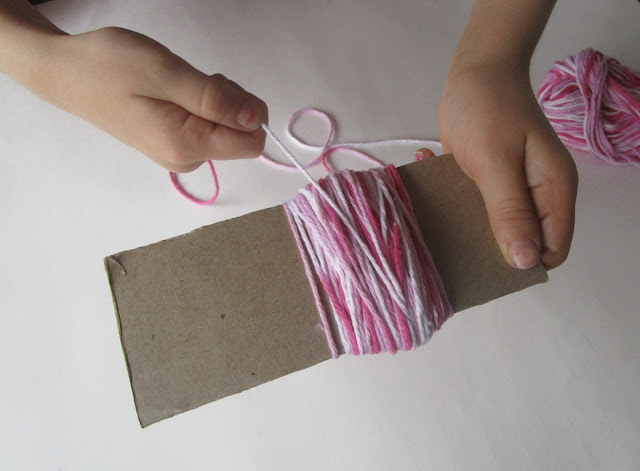 I found that this worked really well for the girls because it was easier than tying the yarn around the middle. They were also able to shape the pipe cleaners into tails or ears if we kept them longer. 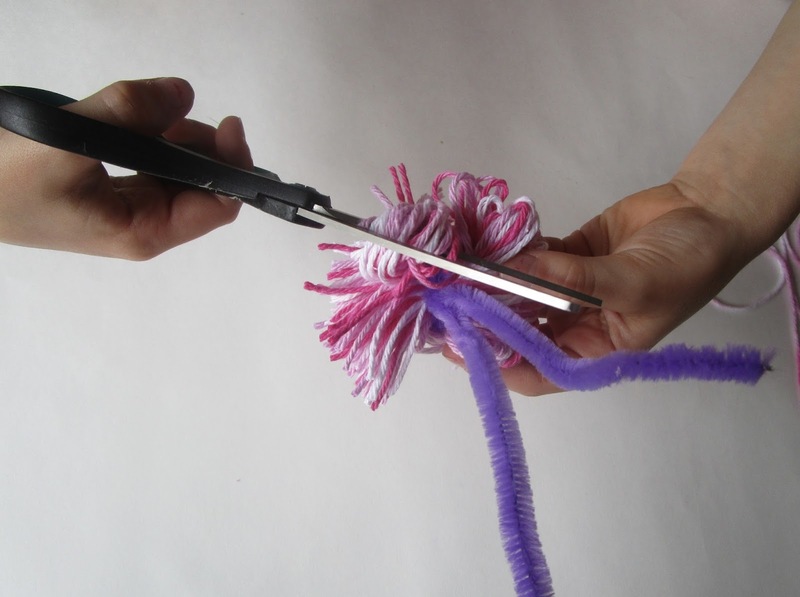 Once the yarn is secured you need to cut each one of the loops that was formed apart. We find it easiest to do only a few at a time. Just slid the scissors between the loop and snip. Now the pom pom is ready for its hair cut. I think this is our favorite part of making pom poms! It is also the messiest, but the fun is worth the mess!! 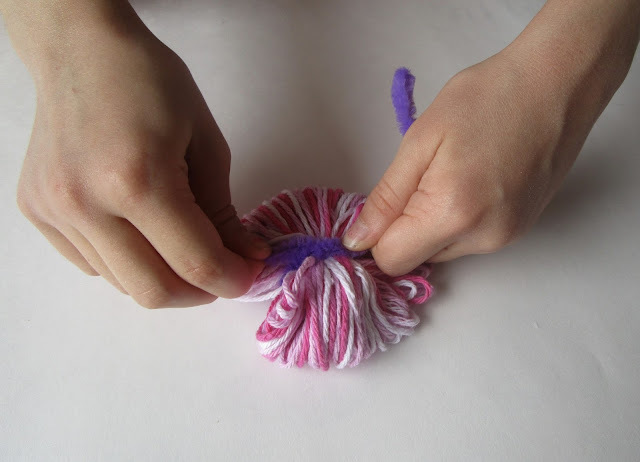 The girls held the pom pom by the pipe cleaner tail, then trimmed their pom poms until they were happy with the shape. Finally, lets get decorating!!! The girls cut out shapes from felt, craft foam for ears, noses, legs, wings, teeth or whatever else they thought their animals needed and then used the hot glue gun (with my assistance) to glue them on to the pom poms. They also added wiggly eyes and shaped the pipe cleaners to make wings. To help the girls get ideas for the pom pom pets they looked at books and we googled some of the animals so that they could see the different features they needed to include. This was actually their idea and I was so proud of them for asking to see a picture for reference. The girls were really proud of their pom pom pets!! 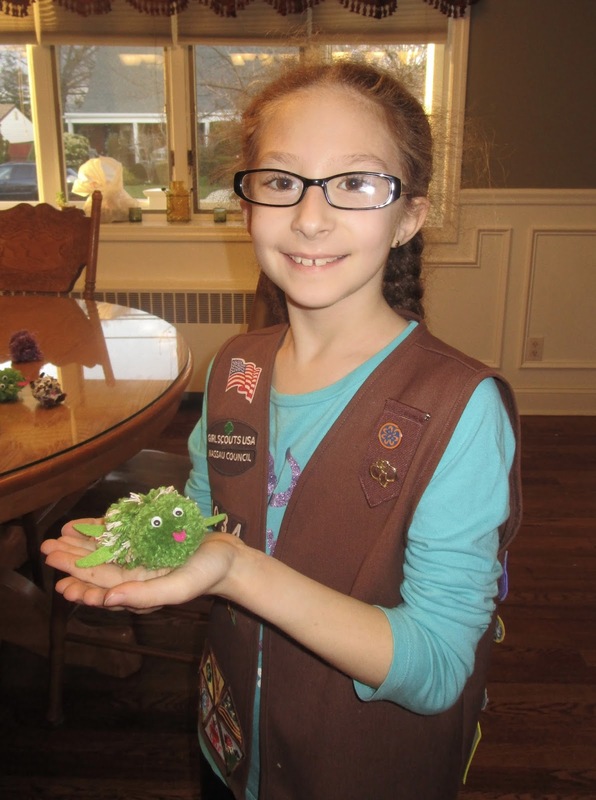 Emily made a turtle and a caterpillar pom pom pet. 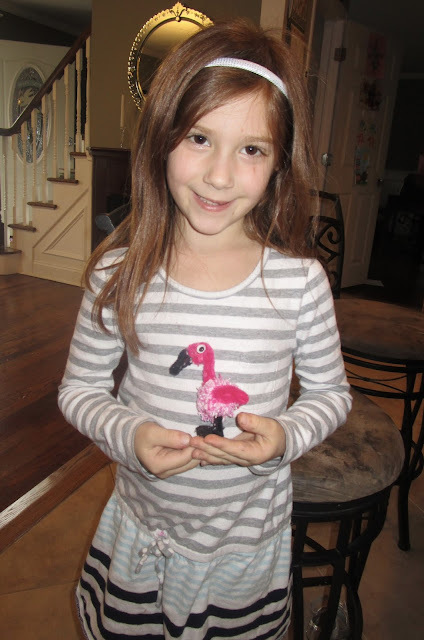 Juliette made a flamingo and a bunny pom pom pet. 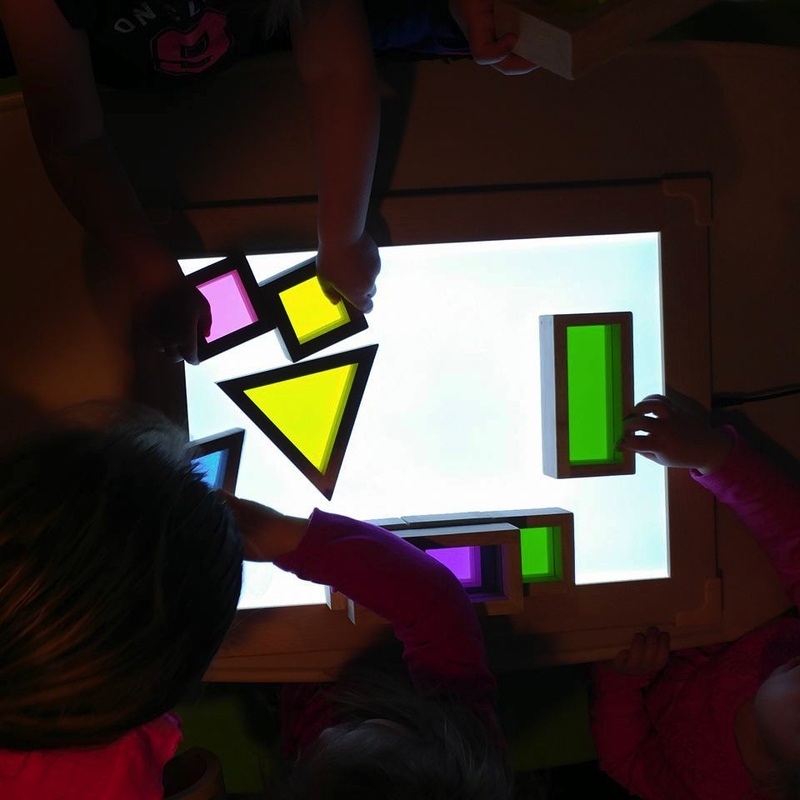 This week at our Mommy and Me TOTSchool class Clara explored colors and shapes on this awesome Guidecraft Light Table for the first time. She loved moving the Rainbow Shape Blocks around and stacking them to make new colors. I have seen homemade versions of this on Pinterest and now I definitely want to make one for us to use at home. We learned about the color green and she had a great time finger painting with yellow and blue paint to make the color green. Clara loves to finger paint and she spent the whole time spreading the paint around and making designs with her fingers. We have been working on doing harder puzzles together and Clara was very excited to put this Frozen puzzle together. She is getting much better at matching the pieces by looking at the pictures. We had a great time playing at our friends house and making Homemade Slime together. Clara helped decorate the cupcakes that we made to donate to Birthday Wishes, an organization that throws birthday parties for children living in homeless shelters. You can read more about how we helped Birthday Wishes by making goody bags. Emily and Juliette LOVE Spot It, which is a fun game where you have to spot the object that is the same on each card. It is a fast paced game because you just put the card down and call out the match. Clara wants to play with her big sisters so I am teaching her how to play. For our version I just have Clara look at the card and find the match. Then, I go and we take turns until all the cards are finished. This was a simple open-ended art set up that actually turned into a name writing practice. I set out paper and paper strips with stickers and the new scented gel pens that Clara received from Uncle Keith and Aunt Nicole for her birthday. Clara loves scented art supplies and has wanted to color with these nonstop since she opened them. She started drawing and then when I came to check on her she asked for help with her name. We picked different colors to practice her name in, so far she can write the C and the L, but then has trouble with the rest so since she is showing an interest in it I am going to continue working on this with her next week. 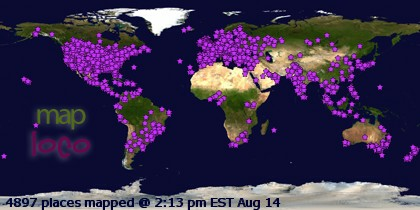 Check out the great things that others are doing with their children by clicking on the buttons below!! Homemade Slime is something that Emily and Juliette LOVE to make and play with. We have made this homemade slime recipe with their cousin, for Emily's science themed birthday party and with Emily's Brownie Girl Scout Troop to earn the Home Scientist Badge. It is so easy to make and so much fun to play with. I was so excited when my friend Tracy, from Tracy & Co. (be sure to check out her YouTube Channel!!) asked us if we would like to get together and that she was thinking of making some slime. I told her I had all the stuff and I knew that Clara and her daughter would have so much fun with it. Tracy actually vlogged us making the slime and the girls playing with it so you can watch us in action. 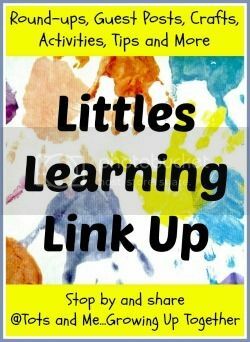 You will need: glue, water, food coloring, borax, some measuring cups and spoons, a bowl or cup to mix the slime in and either spoons or popsicle sticks to mix with. First, I put 1 part glue (I used about 1/2 cup) in a cup for each girl. Then I added 1 part water (I used about 1/2 cup) and had them mix that together with their popsicle stick. Each girl picked a color that they wanted their slime and I added a few drops of food coloring to the cup of glue and water and let them mix it together a little bit more. While the girls were mixing the glue and water together, I added 1/2 tsp of borax to 1 cup of water and we mixed it together until it was dissolved. Finally, I added about 2 parts of the borax solution ( I used about 1/2 a cup) to the glue and water mixture and had the girls stir it together. Almost instantly you can see the slime forming and feel it sticking to the popsicle stick. At this point we just took the slime out of the cup and used our hands to mix it together well. This recipe is very forgiving, if you have to much water just pour a little out and if it is not slimy enough just add a little bit more of the borax solution. The girls had fun squishing and pulling and stretching the slime. Tracy even put out cookie cutters and it was fun to put a glob of the slime in one and watch it spread out as it sat in it. This slime will last for awhile as long as you keep it stored in a sealed ziplock bag or another airtight container. Last week was Clara's 3rd Birthday and she has really been enjoying having Muffin Tin Monday lunches so I was really happy that I could make one for her on her birthday. I let her pick what she wanted in each cup so that it was a special meal for her. Clara was really happy about her Muffin Tin Lunch!!! Be sure to check out our other Muffin Tin Meals for lots of yummy lunch ideas. 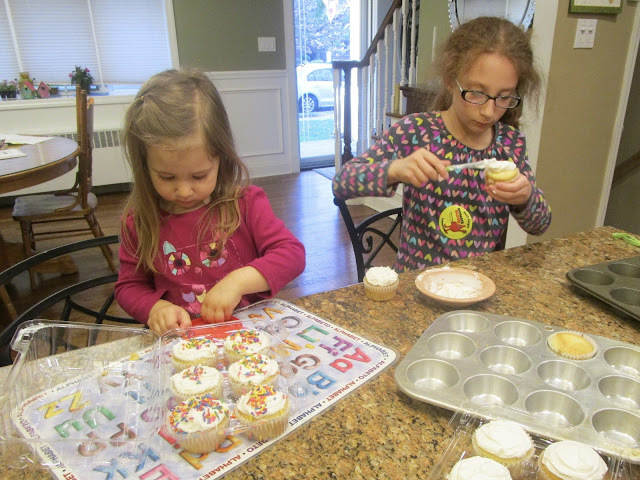 This week we had a lot of fun celebrating Clara's third birthday and most of our activities were planned around things she liked or wanted to do. Right now Clara really enjoys playing with her babies and other dolls, especially Emily and Juliette's American Girl Dolls. I really like giving lots of opportunities for Open Ended Art, as much as I love the finished project of structured crafts and art projects I know it is very important to let her just explore with different mediums. I set her up with paint, different brushes water and a large piece of paper and let her just paint. In the end we talked about the different colors she used and where they were on the paper. Her most requested activity this week would definitely be our Birthday Themed Sensory Bin, which she went to play with on her own many times throughout each day. At our Mommy and Me Totschool Class with we learned about the color purple and triangles. The kids worked together to mix their color pallets to make different colors. Here Clara and her friend are making green. Clara poured red and blue water into a cup to make purple. Finally she colored a "Color Wheel Flower" each petal was a different color, she had to match her markers to the color on the petal. I love finding new and exciting places to visit with the girls. The other day we visited Tackapausha Museum and Preserve for the first time with some of our friends and we had such a nice afternoon there! There was enough to keep all the kids entertained for awhile and it was very inexpensive. I can't believe that it took us this long to visit it. Our favorite part of the museum were all the different live animals there were to see. There is a reptile room and we saw a huge Iguana, a legless lizard, turtle and a gecko along with many other insects and small animals. We also really enjoyed exploring the exhibits within the museum. 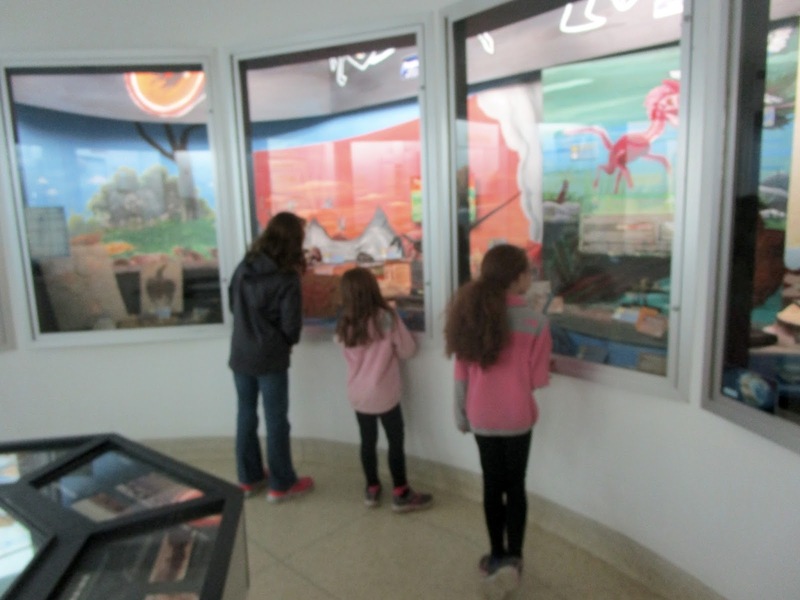 We learned about Life Cycles, Food Chains, Food Webs, Fossils, Dinosaurs, History of Long Island and so much more. Another great part of the trip was the scavenger hunt that the museum has set up for visitors to work on. There were different pictures on a clip board that the girls had to look for within the exhibits. They really enjoyed this and were so excited when they found each object or animal. Clara was definitly most excited for the different animals that were in the museum. She kept going back to check out the fox and opossum, which were her favorite. They also had a screech owl and bats! Finally, outside of the museum there was a nice play space with a music area, nature checkers, digging and climbing areas as well as a fire pit that groups could reserve for camp fires. We also walked through one of the shorter trails to a pond were the girls LOVED watching the ducks, geese, swans and turtles.